Fisher´s XP speaker series from the mid 1960ies to 1970ies are even today of interest due to their decent manufacturing, materials and sound quality. The company´s shift to produce less expensive, non-high fidelity speakers started around two decades later in the early 1980ies. The Fisher XP-7 speaker entered the US market in 1966 when Fisher decided to stop the production of their older models XP-1A, XP-2A and XP-4A. Instead, Fisher introduced three new models to at a competitive price: The XP-6 for $99.50, the XP-7 for $139.50, and the XP-9 for $199.50. 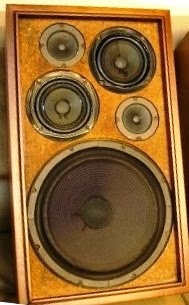 The XP-10 was not replaced and remained Fisher's flagship speaker for $249.50. All speakers of the series with the exception of the XP-5a (the entry level model) were equipped with the newly invented soft-dome tweeter by Hecht, first mounted a year earlier on the XP-10. For more information about the XP-10 or Hecht´s invention of the first soft-dome tweeter, read our Fisher XP-10 review. The XP-7 became a popular speaker at the time, as it was positioned between the much heavier and more expensive XP-9 and the XP-6, which was just below a 3-digit price. The pricing of the XP-7 model allowed customers to enter the high(er)-fidelity market at a price that was closer to the low-end (XP-6) than to the next better model in the product line (XP-9). The Fisher XP-7 had been on the market from 1966 to 1969. It’s still around and frequently being restored. While there are newer models of the same speaker on the market (XP-7b and XP-7c), this one has still been the go-to speaker for a number of years. 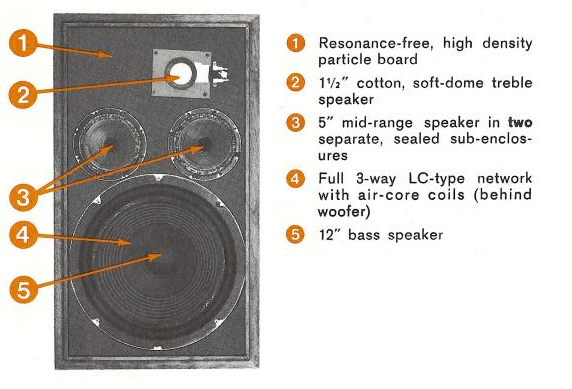 It is a three-way speaker system that contained a total of four speakers housed inside of two mid-range units and then sealed into sub-enclosures. With dimensions of 14" x 24 1/2" x 12" the XP-7 is one of the heavier speakers at approximately 45 pounds. 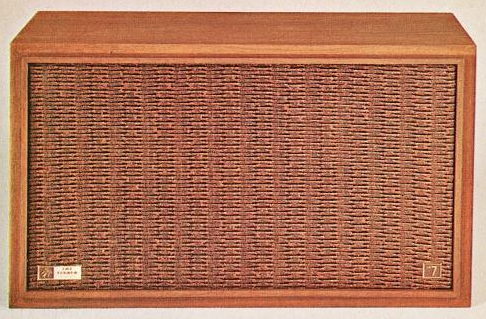 It had a free-piston design as well as two five-inch mid-range speakers that were sealed into separate sub-enclosures. AcoustiGlas was used to fill the enclosures. The drivers are encased in a walnut cabinet with a brass grill. Two later models, the XP-7b and XP-7c seem fairly similar to the original XP-7, but have actually a few noteworthy changes. The driver arrangement does already indicate the differences of the models. Note the diagonal placement of the midrange drivers and tweeters of the XP-7b and XP-7c in the picture on the right. The original XP-7 has a very different arrangement, as you can notice in the picture below this paragraph. Most noteworthy is probably that the XP-7 is a 4-speaker threeway system and the XP-7b and XP-7c are 5-speaker fourway systems. All of the three speakers have a 12 inch bass driver, but whereas the XP-7 has two identical 5" midrange drivers, the XP-7b and 7c have two 5 3/4" midrange drivers, one for the lower midrange and one for the upper midrange. At last, the Xp-7b and 7c have two 3" tweeters, instead of the 1 1/2" soft dome tweeter of the XP-7. The introductory prices of the three models were: XP-7: $139.50; XP-7b: $149.50; XP-7c: $169.95. claimed that many Fisher speakers lack a clear sound and are rather heavy on the midrange. We perceive the XP-7 to be surprisingly clear and not at all to heavy in the low and midrange. As Fisher stated in their own advertisement "...since its introduction, the XP-7 has been awarded more top-level ratings from important national consumer magazines than any system of comparable size and cost". The main weakness lies on the fact that older Fisher XP-7 speakers are sometimes in fairly bad shape and need repairs. This means that you have to know a little something about the speakers if you want to get them up and running. The 12-inch woofer doesn’t come out easily, which means it may happen that you damage the cabinet in order to get it out. If you enjoy spending a little work on an old pair of speakers, the XP-7 can be a nice project. I just bought a pair of XP-7's from Tin Can bay in Queensland, Australia for $80. Excellent condition all round. I have two sets of XP-7b's in my garage driven by an Pioneer SX 1280 and they want to blow my walls off! Sounds just like a bar I used to go to. Just fantastic! I have a pair of XP-7's I ordered before I left Viet Nam in 1968. They still look like the day I bought them and still sound as good as ever. The back side doesn't open. You have to carefully remove the grille, which is held in place by very small nails, and the remove the woofer to get to the terminal plate.